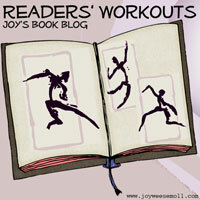 Every Tuesday at Readers’ Workouts, we share our exercise successes and challenges. Participation is great for motivation and support. Join us! My July goal is to exercise 1400 minutes including 15 Wii workouts. Last week, after a hot spell that sent my exercise indoors, I was behind on the minutes but ahead on the Wii workouts. This week, I got back into the garden, so now I’m ahead on the minutes but I’ve lost ground on the Wii workouts. Being never quite on track reminds me of that anecdote that motivational speakers use — that the Apollo rockets were off course to the moon 97% of the time. I don’t have to be on track — I just need to know my goal and be willing to make course corrections. How are you doing with exercise this week? Post on your blog and add the address to the link list or record your efforts in the comments. We’d love to have you! That is the truth – course correction is so valuable and you will get to your goal! Keep it up! After coming across your blog a few weeks back, I have decided to take a very bold step and to blog about my fitness and food programme too! I’m pressing on, feeling stronger and more agile. Keeping up with my “minutes” committment but slacking off a bit on the strength training. I’m looking for motivation since I find lifting kind of boring. I’d rather be walking or biking! When I read some of the wokouts linked here, I have to keep reminding myself that I can’t go from 0 to 80 mph overnight. Have to set my own gooals and stick to them. This comment will have to be my link this week. I did blog about a very active weekend but am not sure if it counts as an exercise blog. Love your comment about ‘course corrections.’ It makes so much sense! Hello everyone! So glad to see you’re all exercising! I clocked in with 370 minutes last week. A bit low for me, but we went to DC for a few days. While we did a TON of walking, I didn’t keep track and am not counting it as part of my “official” exercise. I know many of us struggle with injuries, time constraints and other limitations, but the important thing is that we keep moving, doing the best we can, making exercise a regular part of our lives. The benefits are still there and will add up over time. 370 minutes plus a ton of walking surely did some good! I’m new to this meme and excited to participate and read how others manage to fit exercise into their busy lives. I like that you set your monthly exercise goal as a number of minutes rather than a set number of workouts. That likely makes your exercise more flexible and therefore more do-able. The goal of minutes really does help with flexibility. Some months, though, I end up with a lot of exercise in the last few days!